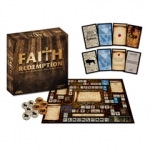 A full selection of board games featuring religious or spritual themes. Feed your soul while you enjoy time with your family and friends! In Apples To Apples Bible Edition players attempt to win green cards by finding the closest associated red card from their hand. Each round is filled with surprising comparisons from a wide range of people, places, things and events from the Bible. Apples to Apples is fun to play and the Bible edition is perfect for youth groups, families and friends. It's as easy as comparing "apples to apples"...just open the box, deal the cards, and you're ready to play! Blurt! The Bible Game of Word Racing! Try this simple, yet fast-paced game. See how quickly you can identify the word being described...Thanks to God expressed before and after meals...Grace! Bible Blurt is a great family game with a junior version included! Includes fun definitions that are fully referenced form the New International Version of the Bible. Get ready to blurt! Bibleopoly combines the Monopoly style fun of property trading with the important cities of the Bible. Players will start IN THE BEGINNING and journey through Bible cities, Meditation, Community Celebration, and sometimes the Abyss as they work toward their ultimate goal of building a church. Players earn a Cornerstone by helping a fellow player or doing Community Service. They then make offerings to earn the bricks and steeple needed to build the church. Land on GO MEDITATE and wait it out for three turns. Faith cards intervene and may have you swallowed by a fish or make you the caretaker of Jerusalem! Be the first to build a church in a Bible city to win Bibleopoly! An archeologist, Dr. S needs your help to decipher and uncover secret words. He needs assistance sifting through ancient tiles and linking them together to gain clues to a message. Dr. S has started a Log Book detailing the links between the tiles. According to the legend, when you recreate the messages using the ancient tiles you will uncover clues to a secret word(s). Find the tiles, build the links, read the writings and claim your reward of wisdom, one word at a time. Forgiveness is never more than a prayer away. Faith and Redemption is a Christian game where players gain followers throughout their epic journey from the Garden of Eden to Judgment Day. As players gain followers, they are granted prayers and miracles that help them overcome the ever-present temptation of sin. Although Faith and Redemption represents a fallen world, redemption is always possible and forgiveness is never more than a prayer away. Act up! Act out! Act fast! 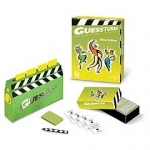 Guesstures, the best selling game of split-second charades, now comes in a fun-filled bible edition! Quick! You only have few short seconds per word! Your four words this round are "Baptize," "Cross," "Moses" and "Lamb". It looks easy, but it's not. As soon as your team guesses the word on the card -- grab it before it gets swallowed by the card-hungry Mimer Timer. Then hurry on to the next card! The harder the word, the more points it's worth. Grab the most points to win! Outburst - Bible Edition is a fast paced party game that is sure to challenge as well as entertain! Topics include "Names for Christ", "Animals in the Bible", "Sons of Jacob" and "10 Books of the Old Testament". Teams take turns shouting out possibilites during each 60 second round with only ten target answers for each topic scoring points. With over 250 topics this a non-intimidating, laughter-filled game that will provide hours of fun for all! 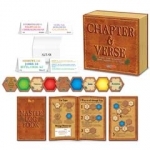 This is the Bible Edition of the award winning Proverbial Wisdom board game. The game challenges players to sketch a proverb for teammates to guess, choose the correct meaning or origin of a proverb, or guess what proverb a pre drawn picture represents. Players have sixty seconds to perform! 500 proverbs, familiar sayings and expressions are included. Scattergories Bible Edition is a fun family game that enhances faith and promotes learning. How many Bible categories can you match before time runs out? Game play is the same as the popular game of Scattergories, only this time the categories are based on the Bible. 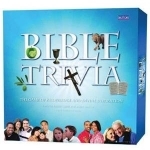 Players try to match as many Bible categories as they can before time runs out. First roll the letter die to determine the key letter for the round.If you can't think of an answer you can just write down any answer that fits the category and you still score points as long as your answers are different from the rest of the players. The player with the highest score after three rounds is the winner! The whole family will enjoy gathering to learn about the life of Christ through this beautifully illustrated and exciting board game. this inspired game is framed in the Bible's geographic and historical context, and features over 1,400 non-intimidating multiple-choice questions about the birth, life, death and resurrection of Jesus Christ. The holy land map on the game board shows locations of major events and follows the chronological path of Christ's life.